The right protective clothing can not only protect against sunburn but also reduce the risk of skin cancer. An SPF rating of 50 can block about 98 percent of UV rays. Today's technological advances in fabrics add considerable protection from UV radiation and, unlike sunscreen, don't need to be messy or reapplied several times during the day. Even while covering up from head to toe during the summer, regular day-to-day clothing allows UV rays to pass directly through its weave to reach the skin. The smaller the weave the fewer number of UV rays pass through. But, this often means that clothing isn't breathable and you might be sacrifice comfort. Also, when such fabrics get wet, due to sweat or being in water, any effectiveness to reduce sunlight exposure is reduced by as much as 50 percent. Based on their ability to deflect sunlight, sun-protective clothing is rated in UPF and this rating is based on the content, weight, color, and construction of the fabric. Designed for the hottest summers, Columbia's Omni -Shade™ can block Ultraviolet A and Ultraviolet B rays and reduces the need for sunscreen lotions. To keep you cool and sweat-free, the wicks in fabrics incorporating Omni-Wick™ Evap pull moisture away from the body so that sweat can evaporate quickly. 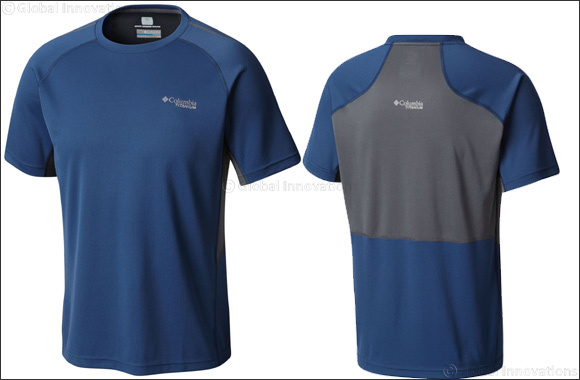 Incorporating Omni -Shade™ and Omni-Wick™ Evap, the Solar Chill Short Sleeve Shirt that is perfect for any terrain, adds sun deflecting technology with UPF 50 protection. Its little dots reflect the sun's rays so well that the fabric will shimmer in any light. The stronger the light, the harder it's working. Making you look good both on and off the water, Columbia's “Performance Fishing Gear” (PFG) line goes one step further and adds quick drying capabilities further to being more lightweight and is also SPF rated to protect you from the sun in comfort and style.